Candlesticks can enhance your trading success. And you can apply them to all markets and all time frames. Choose the training package for you – from beginner level training to the most advanced training you can get. 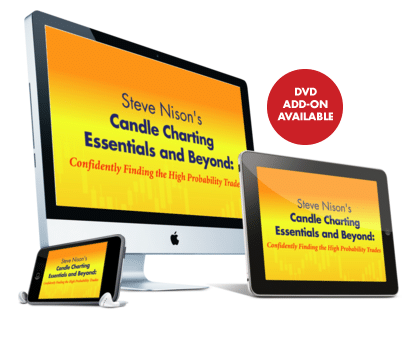 You’ll get strategies from Steve Nison, the undisputed father of Japanese candlesticks. This is a comprehensive candlestick trading program designed to grow your knowledge and skill. This breakthrough training program helps the average trader boost their success with greater knowledge and confidence! "We don't know where to begin to let you know how much we've gained from doing your course…we have reached the stage that we are able to trade full-time together and we'd like to let you know that you've completely turned our trading around for the better. We're so grateful and owe much of our success to you." "The Megapackage is the best ever! What I like about it is that it ties together all the loose ends into one concise entity. There is a lot of information that further the insights into the understanding candles- many subtleties that were revealed only in this package. Again Kudos to Steve for a magnificent effort." **A restocking fee of 15% of the purchase price will be applied. For a customized educational or software package designed around your specific trading and investing needs, contact paul@candlecharts.com or call 732-561-2152.